Your business needs a fast, reliable internet connection – but a game plan if something happens to that connection is important too. Most of the time the internet in your office works great, but what do you do when it’s slow? Do you reboot the router? Unplug the modem? If you’re experiencing a slow internet connection, the first thing you should do is run a speed test. Speed tests are a good way to start troubleshooting, and they only take about a minute to complete. Speed tests measure your current connection’s maximum speed – how fast your device can upload and download information – by accessing nearby test servers. The test mimics your online activity in a controlled setting by downloading sample files and recording speeds. These tests are a quick way to isolate your ISP’s performance as a variable in the quality of your connection, and they can put your mind at ease. 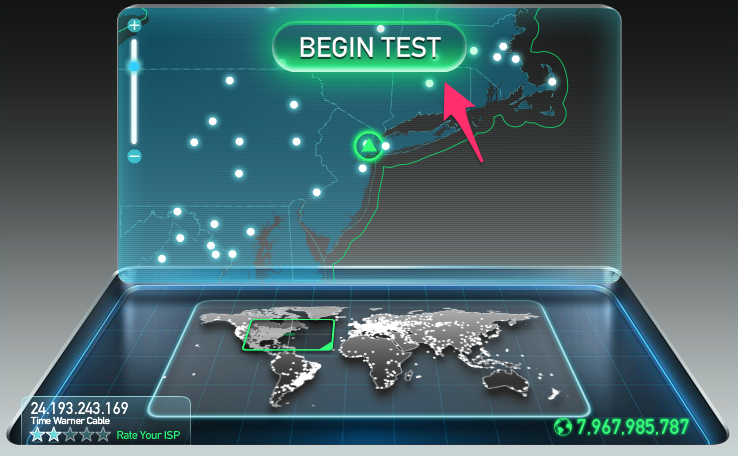 Speed tests won’t tell you your absolute internet speed, but they will give you a close approximation. It’s a good practice to try multiple tests because the results can vary depending on your location and the time of day. Also, different tests highlight different aspects of your connection. Your speed test results should match what’s stated in your ISP plan. Be sure to close any extra applications (Photoshop, Spotify – we’re looking at you) before running your speed test. Sluggish applications will interfere with your measurement. If you search Google for “internet speed tests,” you’ll find a number of options available. Speedtest.net by Ookla is a very good one. This service launched in 2006 from within the tech community in Seattle, Washington. You’ll find their home page is really user friendly. When you hit “Begin,” your computer will attempt to download a file from the test server. As the download completes, your download speed will be measured. Once the download process completes, your computer will attempt to upload a file to the test server, thus calculating the upload speed. You’ll notice that the download speed here is expressed in Mbps (Megabits per second). It’s important to note the unit of measurement because sometimes people will talk about speed using different units. 1 Mbps is the equivalent of 1,000 Kbps (Kilobits per second), and 1,000 Mbps is the equivalent of 1 Gbps (Gigabits per second). Here it’s 23.16 Mbps. Both your upload and download speeds should score approximately close to the numbers stated in your ISP’s service plan. You can see here that they aren’t always the same. That’s because most connections are designed to download faster than they upload. The majority of online activity—like loading web pages or streaming music—consists of downloads. Upload speed comes into play when you’re sending big files via email. Or if your business does a lot of video conferencing, it’s important to have a healthy upload speed because you’ll be uploading a lot of video. An ethernet cable: Connecting to your modem directly is always going to be faster than a wireless connection. When you rely on Wi-Fi’s radio waves, you’re putting yourself at the mercy of materials like brick and stone that will block them, and materials like ceramic and concrete that will reflect them entirely. A solid-state drive (SSD): A traditional hard drive writes data onto a physical platter and reads it with a movable head, an operation which takes about 10-12ms to complete. Solid-state drives, on the other hand, can access data in 0.1ms or less because they store it in in electrical circuits. This affects the speed at which your browser can store and access information from the internet. A CPU: Contrary to popular belief, the speed of your CPU (processor) does have an effect on the speed at which you browse the internet. With gigabit speeds, you download data incredibly fast, but that’s only part of the equation. There’s plenty of rendering, painting, and running of on-page scripts that needs to be done before you actually get to see and interact with the site you’re browsing to. 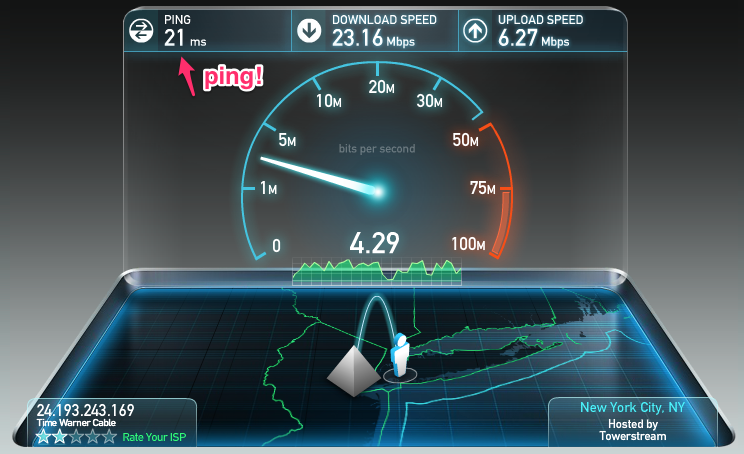 Most services will display a “ping” result, measured in milliseconds, alongside your download/upload speed. Your ping refers to your latency, or the reaction time of your connection. In other words, how fast you get a response after sending out a request. Whether you focus more on ping or bandwidth depends on what task you’re trying to accomplish. If you’re downloading huge files, bandwidth is more important: you don’t need a consistent back-and-forth to merely receive a file. If you’re in an important call or online first-person-shooter game, then ping is everything. 20ms is something of a benchmark: below that, and you won’t have any issues. The farther away the server is geographically, the more the distance might interfere with your results. But if you’re trying to pinpoint the cause of a slow connection, you want to eliminate as many variables as possible. That’s why Speedtest.net picks the server closest to you. Remember that slight discrepancies in your results are normal. There are several factors that can cause fluctuation, and you can always do more tests to get more information. 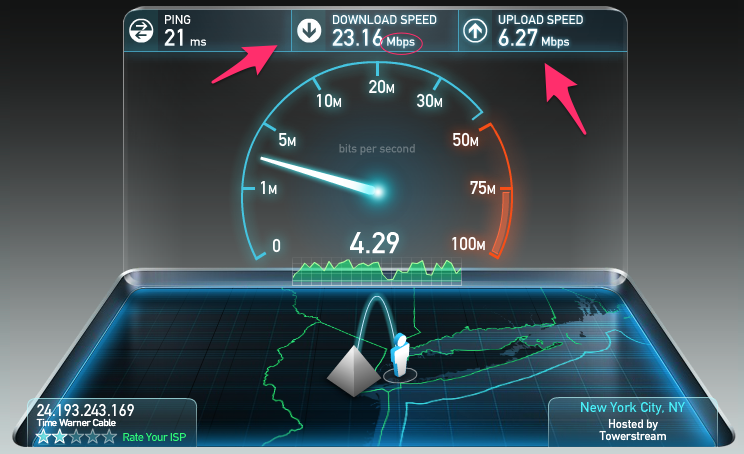 Your speed test results might be inconsistent for a number of reasons. For starters, the tests themselves aren’t perfect. They often use sample files, which differ a lot from the files you might typically use on the web. The other devices connected to your network can also interfere. Say your office’s network has a 100 Mbps download speed. If one of your co-workers starts downloading a massive video file at 20 Mbps, it’s going to limit everyone else’s cumulative speed to 80 Mbps. Bandwidth is limited, and it’s distributed according to who requests it. If you have cable, check each end of the coaxial connection for any looseness or damage—even a small amount of damage can throw your internet connection off completely. Power cycle your computer, router, and modem—disconnect each from power for thirty seconds before reconnecting. If you’re connected via Wi-Fi, turn it off and plug your computer directly into your modem. If all else fails, call your Internet Service Provider. Your ISP might be experiencing a problem on their end. Customer support will tell you when you can expect the service to be back up to peak efficiency. Or they can walk you through the process of troubleshooting faulty hardware. Calling customer support doesn’t have to be as tedious as you might think. Your ISP can help you figure out what’s going on. Maybe there is a storm interfering with your connection, or maybe your modem needs a reboot. By getting on the phone with your ISP, you’re putting the ball in their court. We know that’s not always comforting, and that’s why we’ve tried to make sure that our customer support team here at Pilot is knowledgeable and friendly. If your speed tests keep coming back with bad results, give us a call and we’ll get your high-speed internet back up and running in no time. Click here to try Pilot’s very own speed test.